It’s natural to feel nervous before undergoing any kind of oral surgery, even if it’s a routine procedure like wisdom teeth removal; however, at SoundView Oral & Maxillofacial Surgery in New London, Connecticut, Dr. Ross J. Sanfilippo, DMD, ensures all his patients are comfortable and relaxed before their procedure begins. Dr. Sanfilippo is an oral surgeon, which means he underwent several years of additional training after becoming a dentist so he could perform surgery on the mouth and jaws. While dentists can successfully extract teeth, oral surgeons handle much more complicated procedures, like removing impacted wisdom teeth and even facial reconstructive surgery. Originally from New Jersey, Dr. Sanfilippo received a bachelor’s of science in biology from Fairleigh Dickinson University in 1983. In 1988, he graduated from Fairleigh Dickinson University’s School of Dental Medicine with his DMD degree. Dr. Sanfilippo completed his four-year residency requirement at the oral and maxillofacial surgery department of Nassau County Medical Center in New York. 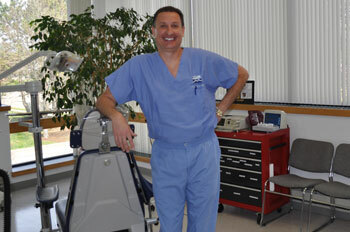 In 1992, he joined Dr. Anthony Petrilli’s private practice right here in New London. Dr. Sanfilippo continues to maintain SoundView Oral & Maxillofacial Surgery in addition to being an active member of the community with his wife and four kids. He is a Fellow of the American Association of Oral and Maxillofacial Surgeons and is board-certified by the American Board of Oral and Maxillofacial Surgery. Dr. Sanfilippo also consults with the State Department of Health for peer review cases. With the help of his staff, he practices the full scope of oral and maxillofacial surgery, performing tooth extractions, bone grafting, wisdom teeth removal, dental implants, jaw reconstruction, and more. Check out the SoundView Oral & Maxillofacial Surgery website to learn more about Dr. Sanfilippo’s team, and call (860) 443-3619 to schedule an oral surgery consultation in New London today.